Page revised in September 2016. Links to this page can be found in Book 5, Map C3, Day 5 and Day 6, View C11, Rione Ripa and Rione Trastevere. 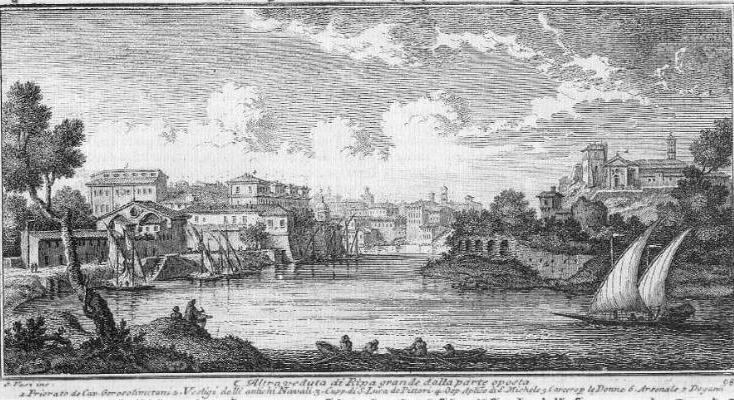 In 1756 Giuseppe Vasi showed Ripa Grande from the north (plate 97) and from the south; in this second plate one of his main objectives was S. Maria del Priorato, the church of the Roman Priory of the Knights of Malta on the south-western edge of the Aventine Hill (on the right side of the plate). At the foot of the hill Vasi showed the ruins of Antichi Navali by this meaning the ancient Roman river harbour. 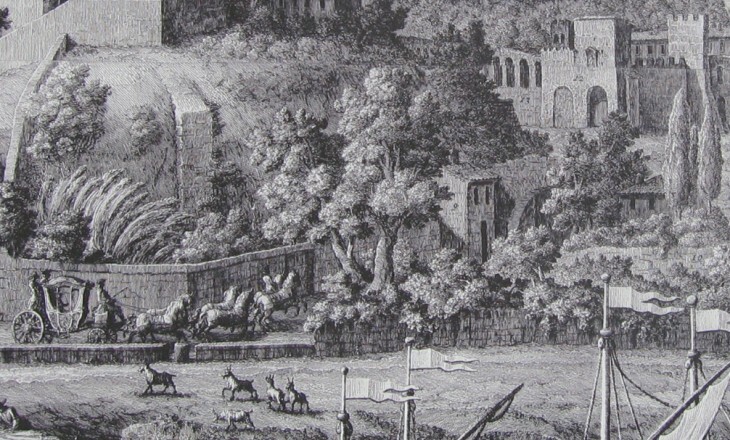 In 1771 Vasi showed this part of Rome in greater detail. On the left side of the plate Vasi depicted Arsenale Pontificio, a shipyard built by Pope Clement XI outside the walls of Rome. The view is taken from the green dot in the small 1748 map here below. In the description below the plate Vasi made reference to: 1) Priorato dei Cavalieri Gerosolimitani (Knights of Jerusalem/Malta); 2) Ruins of the Roman harbour; 3) Dome of SS. Luca e Martina; 4) Ospizio di S. Michele; 5) Carcere Femminile (Women's Jail); 6) Arsenale Pontificio; 7) Custom-house. The small map does not show 3). 3), 4) and 5) are covered in other pages. The beach from which Vasi took his view does not exist any longer, because of the changes made to the river bed in the 1880s to facilitate the flow of the water. They led to the disappearance of small mills, salt-works and other establishments at the foot of the Aventine. Vasi enlarged the dimensions of the buildings of Rome at the centre of the etching. In order to see the dome of SS. Luca e Martina it is necessary to move forward and stand on a modern bridge. 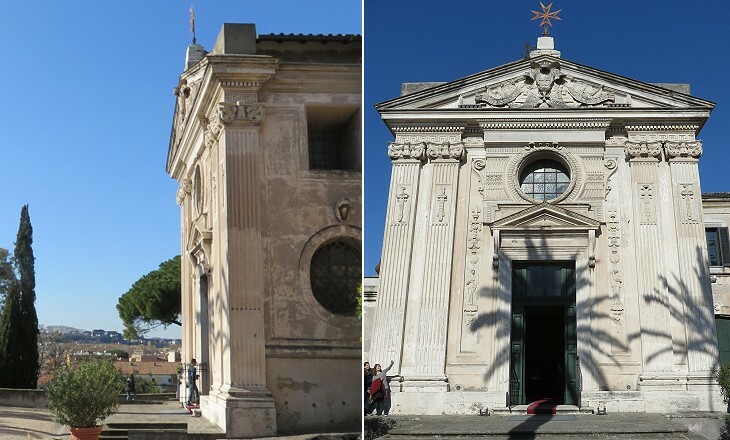 The buildings belonging to the Knights of Malta have not changed much, but the façade of S. Maria del Priorato was redesigned in 1765 by Giovanni Battista Piranesi. The Priory and other properties of the Knights are covered in another page. Giovanni Battista Piranesi is best known for his etchings showing the ancient monuments of Rome; he was commissioned the redesign of the church and of the adjoining square by Giovanni Battista Rezzonico, brother of Pope Clement XIII and Grand Prior of the Roman branch of the Order. The Roman Priory had another church at Foro di Augusto. S. Maria del Priorato is the only architectural work by Piranesi. He overloaded the church façade with a rather bizarre decoration. While anticipating some features of Neoclassicism, its richness shows traces of the Roman Baroque tradition. The tower on the capital is a tribute to the coat of arms of the Rezzonico. A detail of the façade is shown in the image used as background for this page. 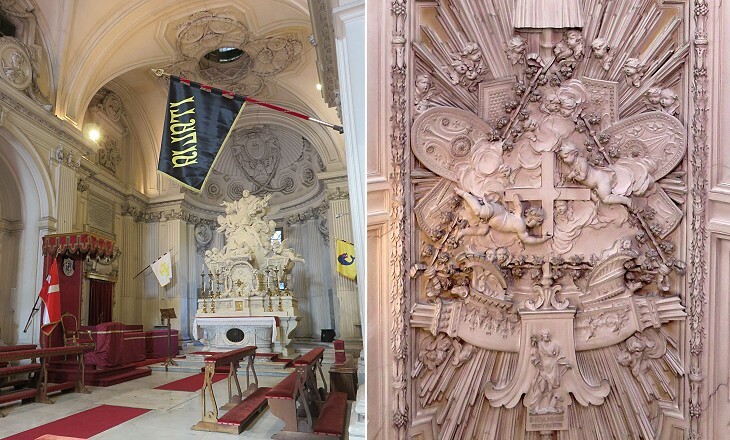 The interior of the church was entirely decorated with stucco, similar to what Piranesi did in the redesign of the square in front of the Priory premises. Its total whiteness brings to mind the interior of S. Ivo alla Sapienza, but Piranesi did not have the same talent as Francesco Borromini. The Knights lost Malta to the French in 1798. Eventually in 1834 the Order established its headquarters in Rome where in addition to the Priory premises it owned a palace in Via Condotti. 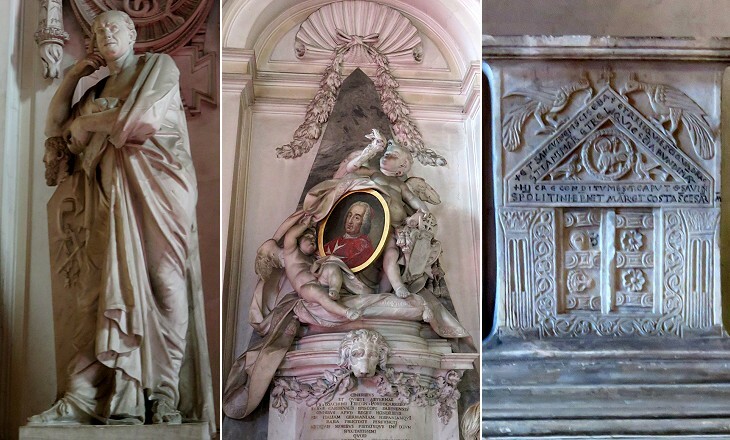 Some Grand Masters (the heads of the Order) are buried in the church; you may wish to see a page on the 2008 funeral of Grand Master Andrew Willoughby Ninian Bertie. 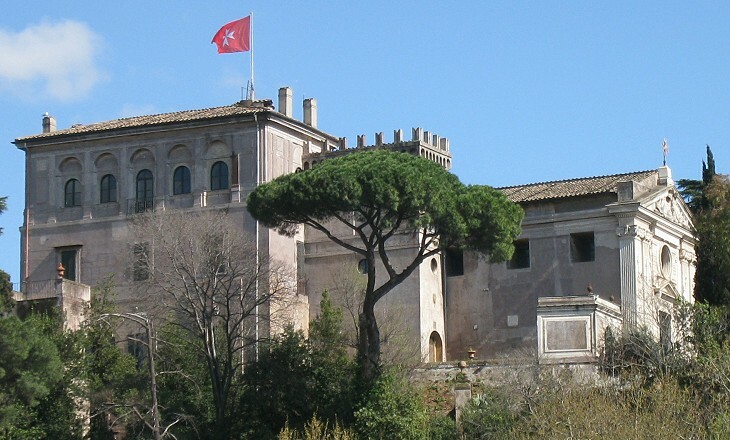 Pope Clement XI tried to facilitate the arrival and storage of supplies in Rome. He built Porto di Ripetta, a river harbour for receiving commodities from Sabina and Umbria, he enlarged the granaries at Piazza di Termini and he built a shipyard at Ripa Grande. 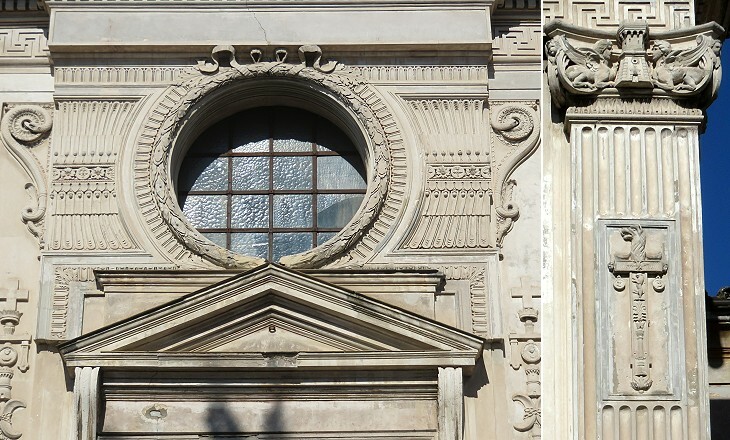 Its main building is characterized by the use of pointed arches, a very unusual feature in Rome. The shipyard was restored by Pope Pius IX in 1853; a rather strange decision because at that time transportation was already based on railways and steamers. The main building was used as a warehouse by a company selling building materials until ca 2010. In 2015 a project to turn the main building and its ancillary facilities into a centre for the experimentation of new forms of art was endorsed by the Italian Department for Culture. At the foot of the Aventine an arch of the horrea (the warehouses of the ancient Roman harbour where commodities were stored) was called Arco di S. Lazzaro, after a (lost) nearby small church. Other remains of the horrea i.e. 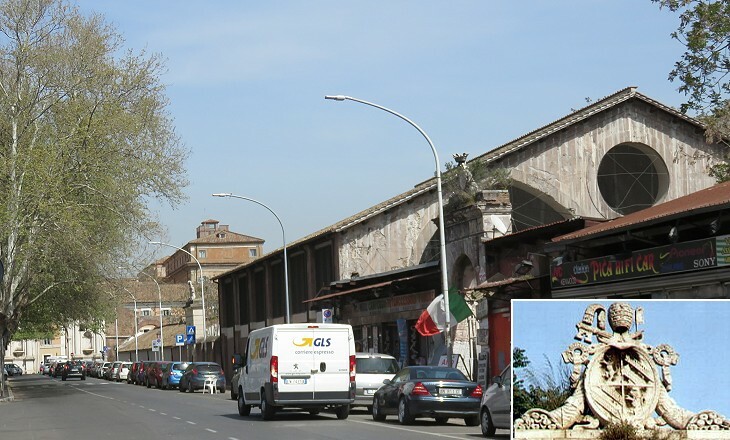 those of Porticus Aemilia can be seen in Testaccio, a modern neighbourhood south of Arco di S. Lazzaro. The area between Arco di S. Lazzaro and the river was called Marmorata (of the marbles) because it was used for unloading marbles and stones and Via Marmorata was the street leading from Arco di S. Lazzaro to Porta S. Paolo. 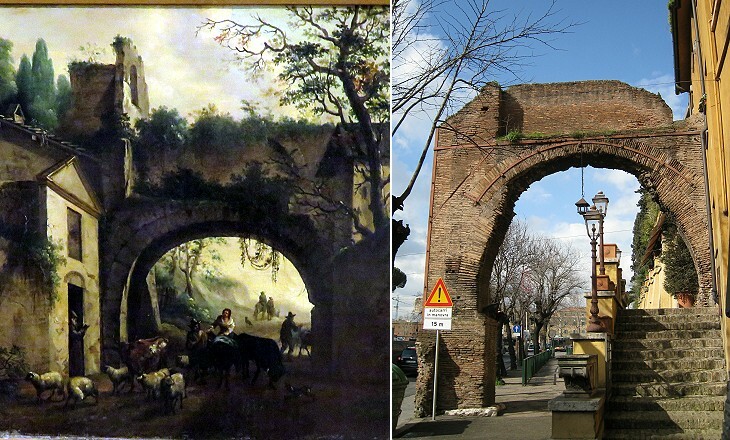 It was a narrow street which passed through the arch (see a detail of Vasi's 1771 view of the Aventine - it opens in another window). It was replaced in the late XIXth century by a modern road which enabled the passage of tramways. 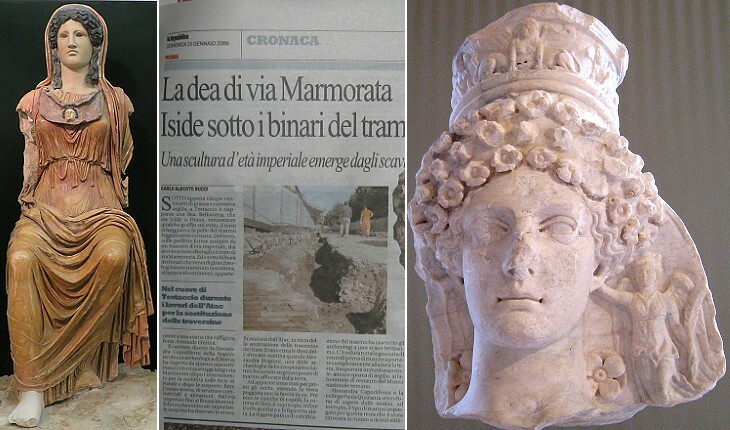 In 2009, during maintenance repairs to the rails, the head of a statue portraying Ephesian Artemis was found, thus showing that there are still discoveries to be made in Rome. 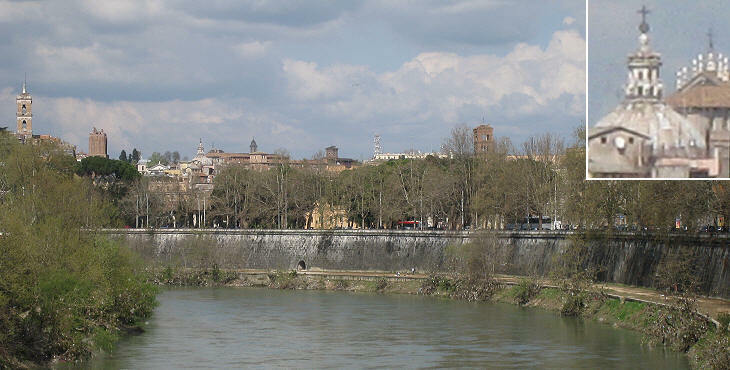 In the XVIIIth century the ruins of the Roman docks along the Tiber were still clearly visible. 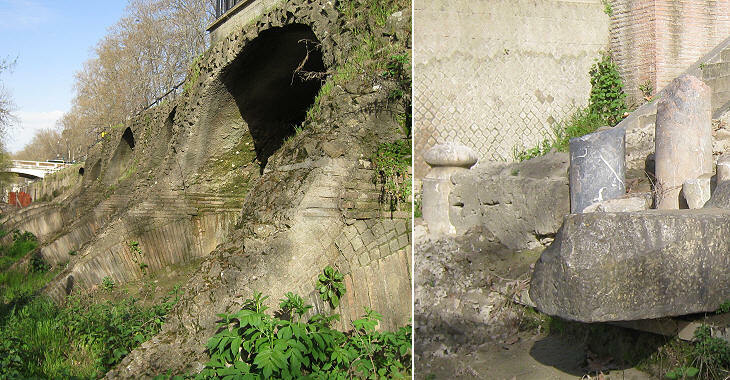 In 1870 Pope Pius IX promoted their excavation (an inscription in Lungotevere Testaccio celebrates this initiative). 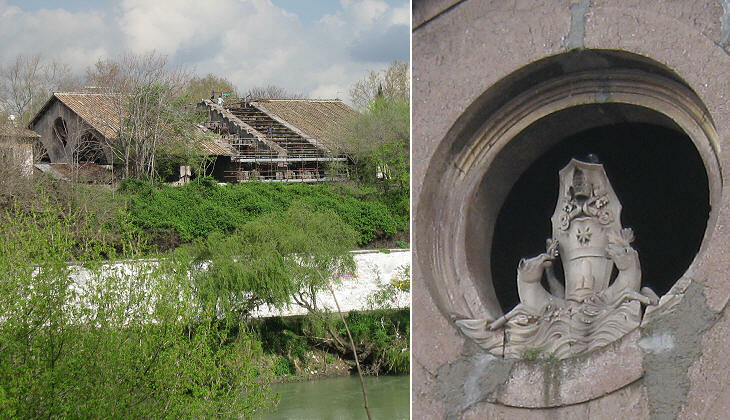 The enlargement of the river bed stopped the excavations which were resumed in the 1990s. They led to a better understanding of how the Romans managed the handling of the enormous quantities of commodities which arrived from the provinces. Next plate in Book 5: Veduta delle antiche Mura di Roma. Next step in Day 5 itinerary: Veduta delle antiche Mura di Roma. Next step in Day 6 itinerary: Chiesa di S. Francesco a Ripa. Next step in your tour of Rione Ripa: Rovine del Ponte Sublicio. Nell'estrema parte del monte Aventino, ove è questa chiesa, si tiene esservi stato il tempio della Buona Dea, alla quale sagrificavano le sole donne. Perciò i fedeli per rivoltare il profano in sagro, v i eressero la chiesa in onore della ss. Vergine, che per essere stata una delle 20. Abazie di Roma, bisogna dire, che vi fosse unito monastero di monaci. Fu ristaurata da s. Pio V. che vi fece l'abitazione contigua, e fu data in commenda ai Cavalieri Gerosolimitani col titolo di Priorato. Questo rozzo, e cadente arco fatto di materia laterizia sembra essere molto antico, e ne' secoli passati si diceva de' sette Vespilloni; ma poi essendovi fatta accanto una cappella dedicata a s. Lazzaro prese il di lui nome. Da Clemente XI. fu eretto l'Arsenale doppio per la fabbrica de' legni da navigare per fiume, e da molti altri Pontefici più antichi li granai per riporvi i grani, che vengono dal mare per servigio dell'Annona di questa Città.